First- I’m sorry I didn’t blog yesterday I am taking this boring five day test over math, writing, reading comprehension, science, and tons more. Second- The real news in baseball isn’t the World Baseball Classic, it is Barry Bonds! Click here to read this shocking story about him. Third- Jeff Kent the legendary second baseman retired today. Kent has a pretty good shot at getting into the baseball hall of fame. More on that soon hopefully. Forth- Jonathan Pabelbon avoided arbitration by signing a one year, $6.25 million dollar deal. Boston also signed Javier Lopez. Theo Epstein has yet to go in to arbitration with any player since becoming G.M. of the Red Sox. More on that soon. Fifth- The Dodgers signed Jonathan Broxton and Russell Martin avoiding arbitration. Sixth- The Red Sox traded David Aardsma to the Mariners for Fabian Williamson. The Boston Red Sox have eleven major league players and five minor league players on the World Baseball Classic provisional rosters. Jason Bay- Bay played for Canada in the 2006 World Baseball Classic. In three games Bay hit .455, with zero home runs, drove in none, and had five hits. Last season Bay hit .286, with 31 home runs, drove in 101, and had 165 hits. Bay will be a great move for team Canada. While he didn’t have great stats in 2006 I think he will have a good 2009 World Baseball Classic. George Kottaras- Kottaras will join Jason Bay on team Canada. Kottaras didn’t play in the 2006 World Baseball Classic. Last season in three games with the Red Sox he hit .200, had one hit, with no home runs, RBI’s, or stolen bases. The Red Sox will watch Kottaras carefully as a test to see how he does against major league talent. Javier Lopez- Lopez will play for team Puerto Rico. Lopez did not participate in the 2006 World Baseball Classic. Last season with Boston he had a two and zero record, with a 2.43 ERA, and 38 strikeouts. Lopez should help team Puerto Rico. He would give team Puerto Rico a pretty good relief pitcher. Mike Lowell- Lowell will join Javier Lopez on team Puerto Rico. Lowell will play in the World Baseball Classic for his first time. Last year with Boston he hit .274, with 17 home runs, 73 RBI’s, and had 115 hits. The Red Sox will watch Lowell closely to see how his hip is. If it gets bad they may tell Lowell to sit out a game or sit on the bench for the rest of the tournament. I think his hip will be fine though. Daisuke Matsuzaka- Dice-K will play for team Japan. Dice-K played in the 2006 World Baseball Classic. He had three wins no losses, an ERA of 1.28, and ten strike outs. Dice-K was a vital part in helping Japan win in 2006. He also won MVP in the 2006 World Baseball Classic. Last year with the Red Sox he had a record of 18-3, with 154 strikeouts, and an ERA of 2.90. I think Dice-K will do fine in the 2009 World Baseball Classic. Hideki Okajima- Okajima will join Dice-K on team Japan. Okajima didn’t play in the 2006 World Baseball Classic. Last season he had a three and two record, with an ERA of 2.61, 60 strikeouts, and one save. Okajima will be great playing for Japan. he could help them to win another title, but the USA will win. 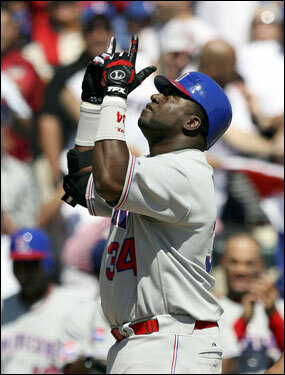 David Ortiz- Ortiz will play for team Dominican Republic. In 2006 while playing in the 2006 World Baseball Classic he hit .150, with three home runs, five RBI’s, and three hits in twenty at bats. Having three hits and three home runs means that all of his hits were home runs. In 2008 with the Red Sox he hit .264, with 23 home runs, 89 RBI’s, and 110 hits. Ortiz has a hurt wrist so he might not be able to play. He also is listed on the list of Red Sox players in the classic but not on the list of players for team Dominican Republic on MLB.com which is strange. Dustin Pedroia- Pedroia will play for my favorite team, team USA! 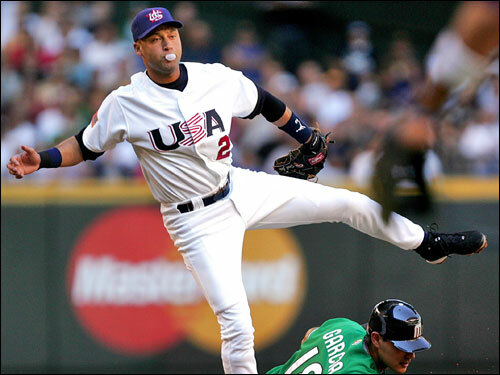 Pedroia did not play in the 2006 World Baseball Classic. Last season he hit .326, with 17 home runs, 83 RBI’s, and stole twenty bases. He also won a golden glove, a silver slugger, and a MVP. Pedroia should be a upgrade for team USA. In 2006 the USA had Chase Utley at second base. 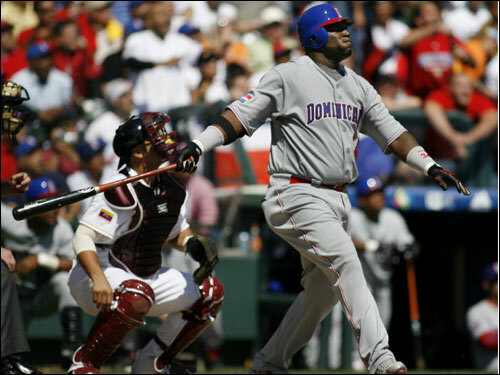 Ramon Ramirez- Roman Ramirez will possibly join David Ortiz on team Dominican Republic. Ramirez didn’t play in the 2006 World Baseball Classic. Ramirez was traded from Kansas City to Boston for Coco Crisp this offseason. While with the Royals last year he had a record of three and two, with a 2.64 ERA, one save, and 70 strikeouts. The Red Sox will look at him if David Ortiz plays to see if any chemistry forms between them. As we all know ( Well not the Y*****s) chemistry wins championships. Kevin Youkilis- Youkilis will join Dustin Pedroia on team USA making the left side of the infield all Red Sox. Youkilis did not play in the 2006 World Baseball Cassic. Last season Youk hit .312, with 115 RBI’s, 29 home runs, and stole three bases. He also started at first base in the 2008 all star game at Yankee Stadium. Youk will be a great ascent to team USA in 2009. The World Baseball Classic is a time where Cubs and White Sox, Dodgers and Angels, and even Red Sox and Y*****s (Hey I’m serious about not putting the Y word in my entries) unite and cheer for Pedroia, Jeter, Derrek Lee, Carlos Quentin, Joe Saunders, and Jonathan Broxton on team USA.